The steps to getting your company involved in social media are simple, and given the right tools and training, your employees can be your best brand ambassadors. Here’s a real-life example of how one brand did just that. We spoke with marketing manager Kathy Dam of Hinge Marketing about her team’s usage of LinkedIn Groups to build brand awareness and drive blog traffic and conversions. Hinge is a professional services branding and marketing firm. With a focus on accounting, architecture/engineering/construction, technology, and management consulting industries, the firm knew that LinkedIn was an optimal place to reach professionals in these verticals. Having a solid grasp on its target audience, the company turned to the social network as part of its content strategy. Team members were unsure of what to say. Individual networks weren’t relevant to the target audience Hinge was trying to reach. Understanding the issues, Hinge’s strategy began to evolve. The marketing team started drafting sample verbiage that employees could use when sharing company content. 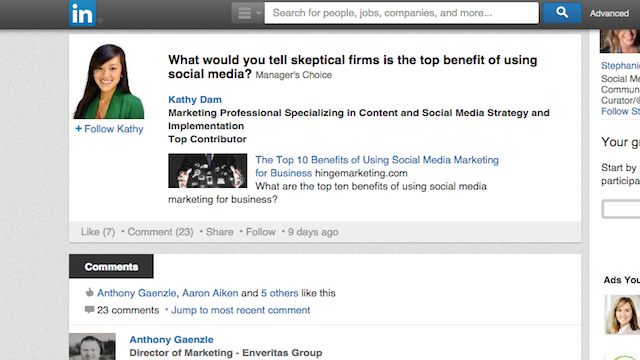 This was done through email and it was written for each of the social networks the team shared on, not just LinkedIn. This allowed for the inclusion of strategic hashtags while being mindful of character limits. Each employee was able to apply their voice to the messaging while still ensuring it was nuanced and hit all the important points. Over time, each team member came to understand how to effectively craft this language themselves. Hinge’s next step in honing its strategy was to redefine the target audience. Rather than push content out to personal connections, the firm looked for LinkedIn Groups that best represented the different verticals that mattered to the company. Once identified, those groups were then assigned to different team members within the company. For instance, it made sense for the accounting team to engage with other accounting professionals. The next course of action was training. This ranged from teaching employees how to navigate LinkedIn and build out their personal profiles to one-on-one training about how to share and respond in groups. The best way to get everyone in the company involved in your social initiative is to make it super easy for them to do so. Not knowing where to start is a huge hurdle that non-marketing team members run into. By educating employees on the importance of social media and the company’s goals for using it, and making additional tools and knowledge available, Hinge has set its team up for success. The Hinge team has been encouraging employees to share branded content on social media for over a year, but the company’s initiative with LinkedIn Groups didn’t begin until July 2014. In the six months since then, its Company Page has acquired 500 new followers, the Hinge website has seen its referral traffic from LinkedIn increase five times, and blog posts now regularly see LinkedIn Shares in the hundreds. We should note that before Hinge restructured its efforts, blog posts typically pulled in less than 100 shares. Today, over half of Hinge’s employees are engaging in LinkedIn Groups, including the firm’s partners and marketing, business development, and account management teams. To build familiarity and credibility within a group, start by engaging in existing discussions. 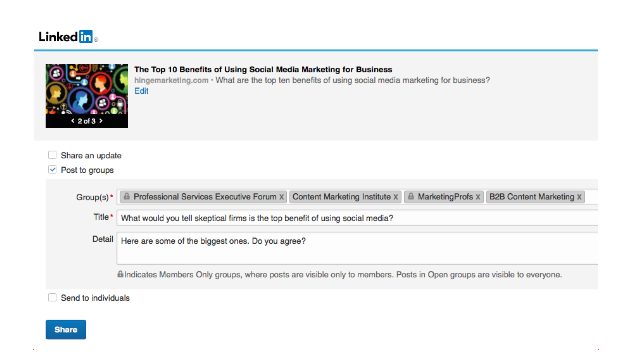 Start discussions with short and simple questions related to the piece of content you’re sharing. Monitor your LinkedIn notifications for comments on your discussions. Reply thoughtfully and end comments with additional questions to encourage ongoing engagement. Avoid being self-promotional — don’t only share your own firm’s content in groups. Most importantly, ignite a sense of purpose and encourage personal growth among your team. Personal branding has become its own industry, so help your team members establish their personal brands and accomplish their goals. By doing so, you make your employees an integral part of the success of your company. And according to LinkedIn, it’s in their best interest to share your content on the platform, because when your company looks good, so too does their affiliation with your company.